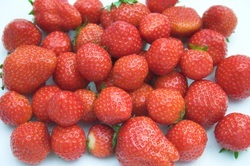 It’s that time of the year when strawberries are ripening and it’s lovely to eat them with cream. But what if you can’t have dairy or you’re vegan? Try this coconut dip and you won’t miss the cream in the slightest! At the time of writing this recipe CO YO natural coconut yogurt is available in the UK and Australia (have a look at their website to see where you can buy it). 1. To make the dip, mix the CO YO and Sweet Freedom thoroughly. Chill in the a refrigerator until you’re ready to serve. 2. Wash the strawberries and dunk them into the dip. You can also serve the dip with other pieces of fruit. Tropical fruit, like mangos and pineapple, work particularly well. Copyright © Tarja Moles. Photograph © Daniel Gilbey | Dreamstime.com.